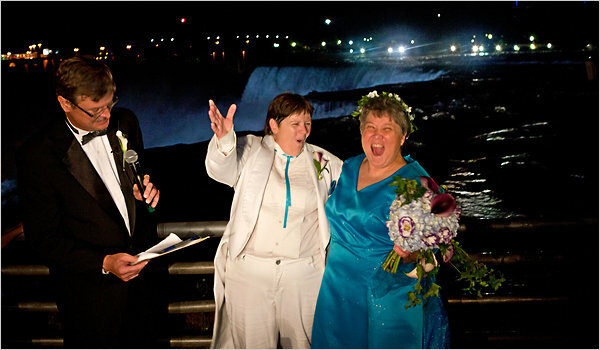 Sunday, gay and lesbian marriages began to take place in the state of New York. The first marriages took place just moments after midnight as couples who have been waiting years to get married simply did not want to wait any longer than need be. According to the New York Times, couples were given waivers that exempted them from having to wait a full 24 hours after they got their marriage licenses to when they could hold their ceremonies. A reported 823 couples have already entered marriage offices to get their marriage licenses. The line in the Manhattan office to get married was deep in the hundreds. Throughout the state of New York, from major cities to smaller towns, couples began to tie the knot. Couples both old and young who have been together for years were proud to get legally married on Sunday thanks to the New York State Senate’s decision, by a vote of 33-29, to legalize gay and lesbian marriage on June 24th. Sunday was the first day the marriages could be officiated because it took the new law thirty days to be fully implemented.